Tell Other Golfers You're Playing Today! 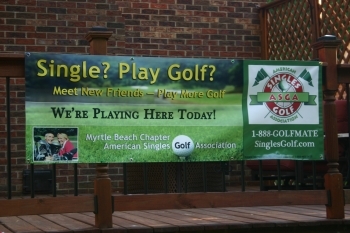 Ever wonder if other golfers know your SinglesGolf chapter is playing golf at the same course you're playing? We're a singles organization and since singles want to meet other singles in quantity, you want to use every oppportunity to spread the word. Chapters can now order a six-foot banner that tells the world that you're playing golf at the course. The banners are made from high quality vinyl and should last the chapter for years to come. There's no charge to the chapter for the banner, however, chapter must pay shipping costs from the factory ($20). Banners will be customized only to the extent of having the chapter name changed. If you're interested in one of these free banners, please have your credit card ready (for shipping only) and call the national office at 980-833-6450 between 9am and 2pm eastern time. Please provide "ship to" address when ordering. Allow two weeks for processing and delivery.